Hi, my name is Dr. Steven Vold, and today I'd like to talk to you about three simple tests that can help your doctor monitor the progression of glaucoma in your eyes. Our best asset in treating your glaucoma is seeing it early. That's why it's so important to be tested early, and throughout your treatment by your doctor. I know these types of exams may seem scary or discomforting, but today we hope that as we go through the process with you, we can set your mind at ease and show you that years of research has gone into coming up with a few simple tests that may be the most important thing you can do to keep your sight. We all have that faucet in our house that just won't stop leaking, or that drain that slowly gets clogged. Well, that is essentially what is happening in someone's eye when they have glaucoma. The eye slowly starts to not be able to drain the internal fluid in the eye, which can eventually lead to damage of the optic nerve. The optic nerve is the eye's main transmitter to the brain. It's like the film in the camera, so to speak. This buildup of fluid is slow and painless, and so for many it can go unnoticed, but over time this damage to the optic nerve is what can create the loss of sight. That's why it's so important to open up that drain before any damage sets in. The first thing that your doctor will do in any eye exam is to look at the front and back of your eye. 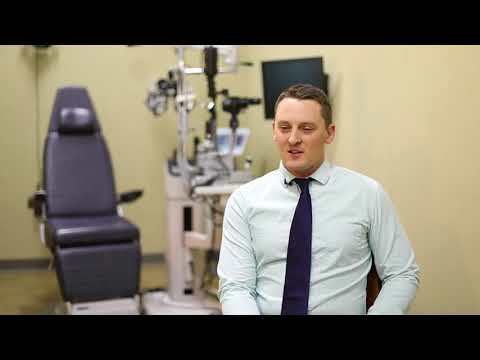 In order to check the front of the eye, your doctor will use what we call a slit lamp. You will be comfortably positioned with your chin resting on a chin rest, and with your forehead against a forehead bar. The doctor will instruct you to look on a specific point where they examine the front of your eye. During the slit lamp examination, one of the most important things to check is the intraocular pressure, or IOP, which is done when your doctor instills drops, and projects a blue light in your eye. Glaucoma affects the drainage mechanism of the eye, and the doctor can use what is called a gonioscopy lens. It's a lens with a mirror that enables your doctor to visualize the eye's drainage site. This is when your doctor can see if your eye is properly draining. When the eye doctor wants to look at the back of the eye, he or she will put in dilating drops, or eye drops, which will make the pupil of your eye larger. This enables the eye doctor to better see the back half of your eye. It's important to look at the back of the eye because that is where the optic nerve is located. Your doctor can look at your optic nerve two different ways. The first way is when your head is resting at the slit lamp. The doctor may use a light and a small lens to look at the optic nerve. The second is when a doctor puts a headlight on and examines the back of your eye with a bright light, while you're sitting in the exam chair. So there are two other tests that your doctor may need to do. The first is to look at your optic nerve, and second is to test your side vision. The optic nerve can be furthered looked at using optic nerve photos. This is a picture of the optic nerve using a camera similar to what you might be using for taking birthday party pictures. The difference is the camera has a magnifying lens to enlarge the picture of your optic nerve. If the optic nerve photos are stable, this usually means that your glaucoma is stable, and any treatment that you and your doctor have begun is working well. The optic nerve can also be looked at using imaging tests. There are many types of imaging tests such as Optical Coherence Tomography, or OCT, that your doctor can use. All of them measure the amount of nerve tissue you have in the back of the eye. The great thing about these tests is that they can be measured over time. If your nerve measurements are stable, that usually means that the course of action that you and your doctor have taken is working well. If you're seen to lose nerve tissue over time, you may need some additional treatments so that you and your doctor can lessen your eye pressure, and of course try to prevent any damage to your eye. Because glaucoma can damage your peripheral vision in such a way that you may not even notice, your doctor may also do a visual field test. In this test, a machine and computer will map your peripheral vision. Just like before, you will situation comfortably with your chin on a chin rest, and forehead up against a forehead rest. A light will appear and you will be asked to press a button when you see it. It's a little bit like a video game. Just like some of the other tests, this test can be gauged over years, and if your peripheral vision remains strong, that is usually a great sign that you and your doctor's course of treatment is working well. If it gets at all worse, then you and your doctor may decide there's another option you should explore. So if you've been diagnosed with glaucoma, there are three things your doctor will want to keep an eye on. The pressure in your eye, the optic nerve and your peripheral vision. And like we've talked about, there are very simple tests that can be done to see exactly where the health of your eye stands. The only thing that can keep you from these wonderful breakthroughs is if you decide not to be tested. So we urge you to take the time, and come and visit us at Vold Vision. You may in turn save one of your most valuable gifts, your sight. Thanks so much.